Based on the description makes education is very important in life, and can not be separated from everyday life, whether, in one's life, family, and nation and state, the advancement of a nation is determined by the advance of education itself. From a theoretical perspective, education is often interpreted by people differently, depending on the point of view and the theory of education that is believed to be true. Differences in the interpretation of education in an academic context is commonplace, even this can enrich the treasures of human thinking and useful for the development of theory. The problems that exist in the world of formal education increase from year to year. One of the main problems facing the Indonesian nation is the low quality of formal education at every level of education. The low quality of education in Indonesia can be seen from the results of a report from the 2015 Indonesia for International Student Assessment (PISA) program reporting 62nd out of 70 countries with competence in science learning achieving an average of 403, averaging 397, and the result of the Mathematics competency earned an average of 386. 2 This is similarly reported by Trends in International Mathematics and Science Studies (TIMSS) in 2015, Indonesia ranked 44th of 56 countries participating with the average score of the students' mathematics score in grade IV that is equal to 397 below the average score of 500. 3 This shows that in particular the primary schools are still very low and the learning outcomes in mathematics learning in Indonesia have not shown satisfactory results. The result of observation of researcher at MI At-Taqwa School 50 Mandala Jaya Tarumajaya Sub-district of Bekasi Regency, one of the problems of low learning result of Mathematics is that students do not look enthusiastic when teachers explain math materials in front of the class. This is because the concept of mathematics learning taught by the teacher that is classical with through the model of conventional learning without looking at the possibility of application of other learning models in accordance with the types of materials, materials and tools available so that when students are given practice questions, students look less enthusiastic about the practice . Experts say that learning outcomes are competencies or particular abilities of both cognitive, affective and psychomotor skills that students achieve or master after learning. 5, 6, 7, 8, 9 Learning outcomes are a very important thing in improving the ability of students. 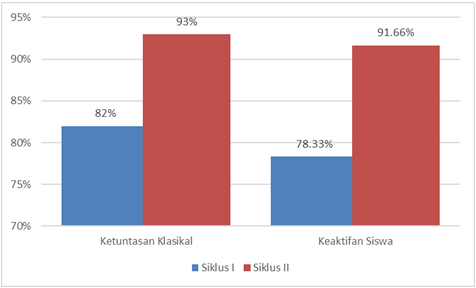 Other causes of low student learning outcomes in fourth-grade students MI At-Taqwa 50 Mandala Jaya Tarumajaya District Bekasi Regency is influenced by two factors: internal factors and external factors. Internal factors are from within the student, one of them is the attitude of student learning in the math lesson. At the time the teacher explains the subject matter of mathematics students pay less attention, so the teacher's explanation of the material to be learned cannot be understood and understood. Many students find that mathematics lessons are difficult so when teachers submit lesson maths lesson students are motivated to learn it. External factors are from the teacher and the learning environment when delivering the subject of mathematics teacher only use teacher-centered learning model or teacher center, and one-way folding. 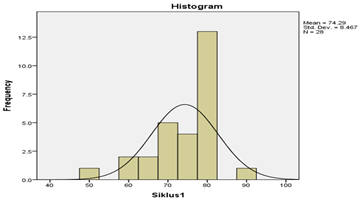 Submission of material that is too fast to be poorly understood by students and inappropriate use of media in mathematics subject matter, giving questions that do not measure students' abilities, as well as a never-changing classroom environment or learning environment, such as student seats. One of the efforts in improving the learning outcomes of fourth-grade students of MI At-Taqwa 50 Mandala Jaya Tarumajaya Sub-district, Bekasi District is by applying the Cooperative Learning Model of the Missouri Mathematics Project (MMP). The Cooperative Learning Model of the Missouri Mathematics Project (MMP) is a structured learning model with the development of ideas and the extension of mathematical concepts. Some experts point out that the Missouri Mathematics Project (MMP) Cooperative Learning Model requires students to be active in learning with teachers as facilitators who assist and help students discover their knowledge. Students are introduced directly to the real object so as to increase the motivation of students to study and master the subject matter of mathematics. The Cooperative Learning Model of the Missouri Mathematics Project (MMP) is a learning model consisting of several steps, namely (1) introduction or review; (2) development; (3) practice with teacher guidance; (4) independent work; and (5) the cover. 10, 11, 12, 13, 14 From that opinion the Cooperative Learning Model of the Missouri Mathematics Project (MMP) is a learning model that is found empirically through research, and consists of several steps, namely daily review, development, controlled exercises / cooperative learning, self-training, and homework. Based on the results of the analysis of the above research, the learning of Mathematics of fourth graders of MI At-Taqwa 50 Mandala Jaya Tarumajaya Sub-district of Bekasi Regency needed an effort to improve student learning outcomes through Action Research under the title "Application of Cooperative Learning Model of the Missouri Mathematics Project (MMP) learning mathematics (Action Research fourth grade students MI At-Taqwa 50 Mandala Jaya Tarumajaya Bekasi Regency. Based on the background of the above problem, the researcher focuses the research on Cooperative Learning Model of the Missouri Mathematics Project (MMP) to improve the learning outcomes of mathematics. in grade IV MI At-Taqwa 50 Tarumajaya of Bekasi Regency. Will the implementation of the Missouri Mathematics Project Cooperative Learning Model (MMP) improve students' mathematics learning outcomes in fourth grade MI At-Taqwa 50 Mandala Jaya Tarumajaya Sub-district, Bekasi District? How does the implementation of the Missouri Mathematics Project (MMP) Cooperative Learning Model improve the Mathematics learning outcomes for fourth-grade students of MI At-Taqwa 50 Mandala Jaya Tarumajaya Sub-district, Bekasi District? 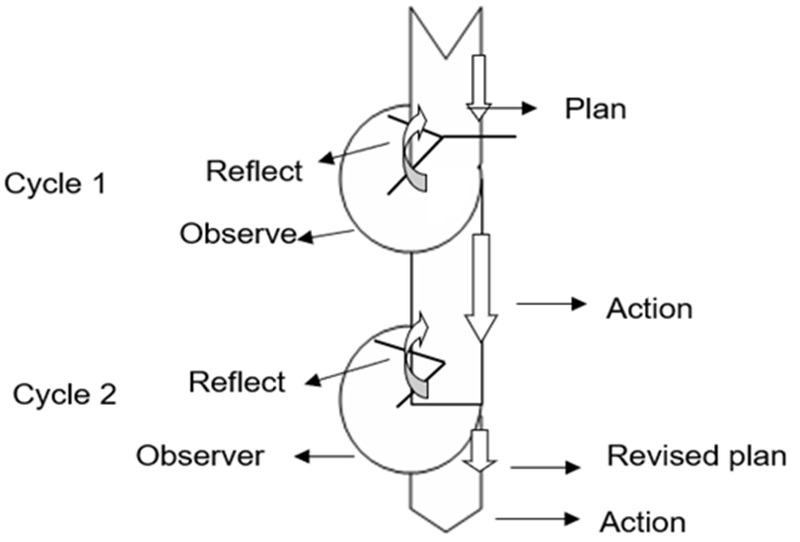 The research model consists of planning, action, observation, and reflection using the cycle as a rejection of success. 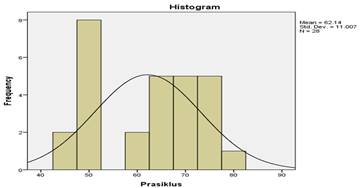 The number of cycles adjusted to the level of problems that exist in the class to be studied. 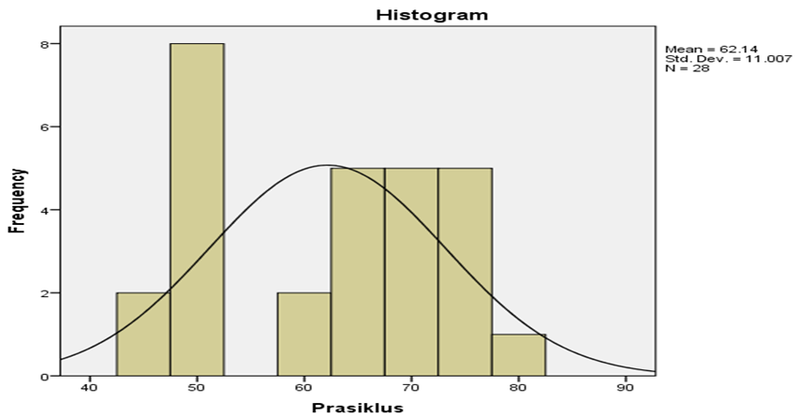 Based on Table 1 and Table 2 above, it shows that the average score of 28 students is 62.14 with the maximum value being 80 and the minimum value is 45. The defined minimum criteria are 70, this indicates that 17 students are getting scores <70 students or 61% of unfinished students and 11 students who scored> 70 students or 39% of completed students. It shows that the pre-cycle of obtaining student learning outcomes has not been maximal, so it will be done by using the Cooperative Learning Model of the Missouri Mathematics Project (MMP) by improving the learning outcomes of mathematics. Based on Table 3 and Table 4 above, it shows that the average score of 28 students is 74.29 with a maximum value of 90 and the minimum is 50. 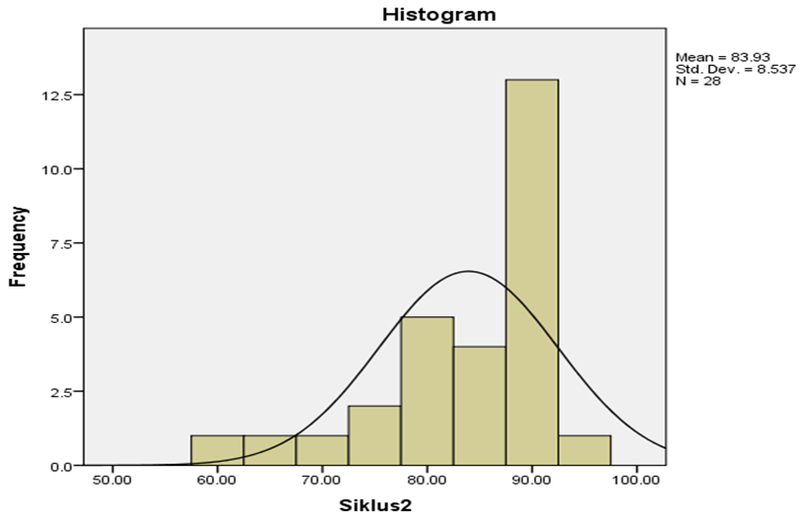 The defined Minimum Criterion is 70, this indicates that there are 23 students who get scores <70 students or 82% of unfinished students and 5 students who scored> 70 students or 18% of completed students. 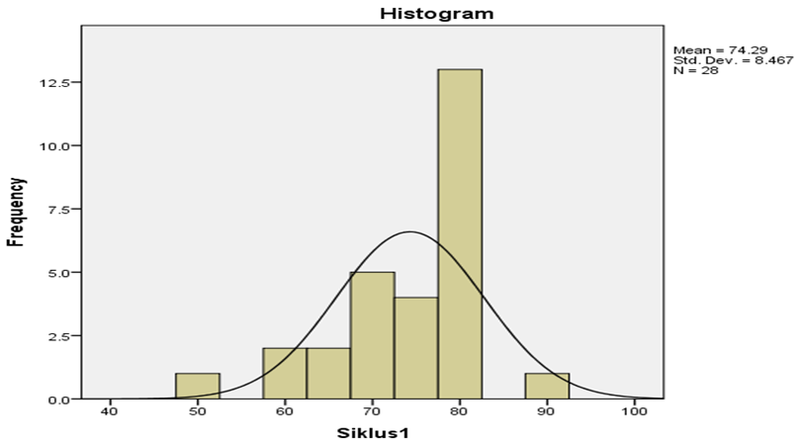 It shows that in cycle 1 to obtain student learning outcomes have maximum however at the average value is still low. 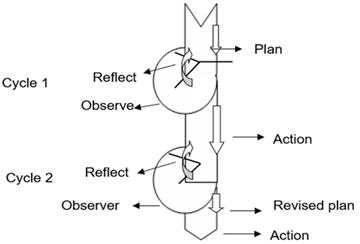 After observation or observation, it can be done a reflection of the actions that have been done in the second meeting II cycle II. During the learning process at meeting II, the shortcomings that occur that affect the learning process can already be overcome. In addition, the barriers to learning can be solved by the actions taken. Based on the result of student observation as many as 28 students. Results of the evaluation results obtained 26 students or 93% complete learning, and 2 students or 7% unfinished learning. In other words, more than 80% of complete students learn, so the cycle is stopped in cycle II of meeting II. Based on the evaluation test cycle I showed that the average value of student learning outcomes is 74.28 with a total score of 2080. From these results, has not reached the success indicator so it should be continued into cycle II. In cycle II the average value of learning results increased to 83.92 with a total score of 2350. so it has reached the indicator of success. 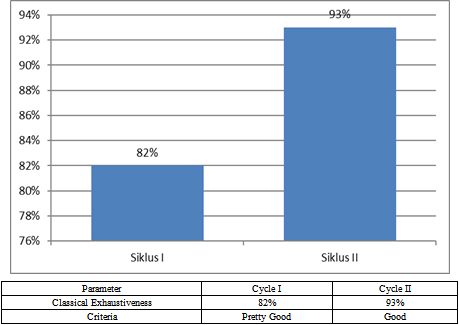 The calculation of the average recapitulation of student learning outcomes in cycle I and cycle II is presented in the following bar chart. Based on the first cycle evaluation test students who scored above 70 were 23 students. So that the classical completeness achieved is 82%. From these results, it is still minimal in achieving the success indicator so proceed to cycle II. In the second cycle students who score above 70 as many as 26 students with achieved classical completeness increased to 93%. So it has reached the indicator of success. The calculation of classical thoroughness recapitulation of student learning cycle I and cycle II is presented in the following diagram. In the first cycle, the average of students' learning achievement reaches 78%, then in cycle II, the mean of student learning activeness increased to 91%. In the first cycle of student's classical completeness of learning achievement reaches 82%, then in cycle II, the average completeness of classical student learning increased to 93%. 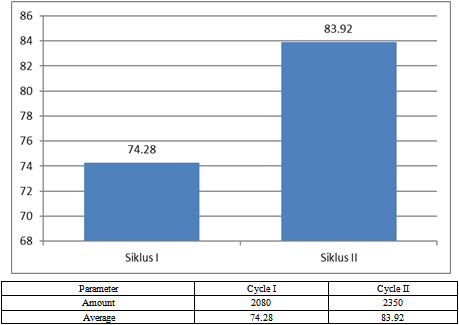 Then, for the average of student learning outcomes in cycle I reached 74.28. While the average of student learning outcomes in cycle II increased to 83.92. Thus, from the results of the cycle I and cycle II can be seen that the learning model of the Missouri Mathematics Project can improve student learning outcomes in learning mathematics. If student learning activeness, the average of student learning outcomes and classical completeness increases, then the indicator is achieved. The learning model of the Missouri Mathematics Project can improve students' learning outcomes in the fourth-grade mathematics learning of MI At-Taqwa 50 Mandala Jaya Tarumajaya Sub-district, Bekasi District. 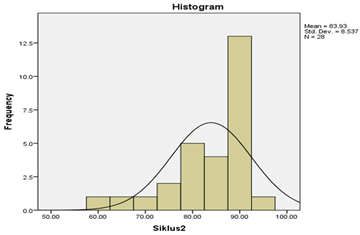 This can be seen from the average of students in the first cycle of 74.28 with 82% classical completeness increased average in cycle II to 83.92 with 93% classical completeness. Novalia, Riska, et al. "Application of Type Cooperative Learning Models Missouri Mathematics Project (Mmp) to Increase Learning Results Math." American Journal of Educational Research 6.8 (2018): 1085-1092. Novalia, R. , Makmuri, M. , Sudrajat, A. , & Adiansha, A. A. (2018). Application of Type Cooperative Learning Models Missouri Mathematics Project (Mmp) to Increase Learning Results Math. American Journal of Educational Research, 6(8), 1085-1092. Novalia, Riska, Makmuri, Ajat Sudrajat, and Adi Apriadi Adiansha. "Application of Type Cooperative Learning Models Missouri Mathematics Project (Mmp) to Increase Learning Results Math." American Journal of Educational Research 6, no. 8 (2018): 1085-1092.